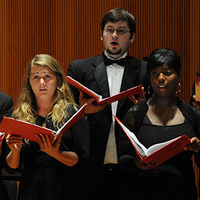 Collegiate Chorale is the premier choral ensemble of the School of Music. The Chorale performed at the 2011 National ACDA Convention in Chicago, in the feature major works concerts at the 2009 ACDA National Convention in Oklahoma City, in the Headliner Concert at the 2008 ACDA Southern Division Convention in Louisville, and at the 2005 ACDA National Convention in Los Angeles. Although the Chorale performs primarily a cappella repertoire, they collaborate regularly with the Louisville Orchestra and Orchestra Kentucky in the performance of major works. The Cardinal Singers, directed by Dr. Kent Hatteberg, have appeared at the U.S./Cuba Choral Symposium in Havana, Cuba in 2012, the Taipei (Taiwan) and Beijing (China) International Choral Festivals in 2010, and the 7th World Symposium on Choral Music in Kyoto, Japan in 2005. They won the Grand Prize at the Yeosu (Korea) International Choir Competition and the H?i An Choir Prize at the 3rd Vietnam International Choir Competition in 2013.